If you enjoy cooking, then you have probably already considered purchasing a food processor at some point or another. It’s important to note that a food processor is a truly a versatile and efficient tool for the kitchen you will ever find. Once you have tried a food processor, you will have to have your very own to continue cooking. The right processor can be used to grind spices, grated cheese, puree baby food, and even chop up the ingredients for salsa. The list goes on and on of what a good processor can do for you in the kitchen. SharkNinja manufactures a variety of food processors. This update features two of their best. 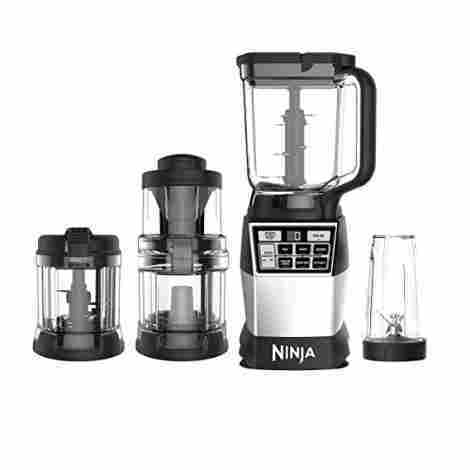 They are Ninja Food Chopper Express and Ninja 4-in-1 Blender and Food Processor. The Express model was placed in the top three. Everyone today has a busy lifestyle and often you find yourself wishing you had just a little more help in the kitchen. While a food processor can’t do it all for you, it can save you a ton of time and take over some of the more intensive labor involved in the cooking process. However, it’s also important to remember that there are many different types of makes and models on the market today for processors and you want to choose the best one for the job. These processors could work in a variety of models, from fully-loaded processors with bells and whistles galore to your basic budget-friendly food processors that don’t do quite as much but are fully functional and do an awesome job. With that many choices on the market, it’s no wonder it’s so hard to choose. Zyliss is a manual food processor and chopper that works well when you want to chop or dice something in a hurry, and not pull out the electric food processor. It's a hand-held dicer and slicer that comes in color choices of red and green. 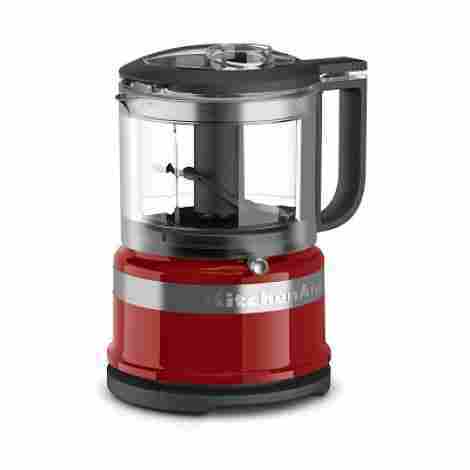 This is the perfect manual food processor for having in the RV, taking on camping trips, or for use in a small kitchen. The 25-ounce bowl of this manual food processor is easy to clean and it and the blades are safe to put on the top rack of the dishwasher. It is recommended that you wash the lid manually, however. The smallness of the food processor makes it easy to store and features a collapsible handle so it will fit just about anywhere. The compact design and cut look make this manual food processor, chopper, slicer, and dicer valuable and the fact that it can be used handily and is easy to clean makes it worth the asking price. Prepping food for a favorite recipe is simple with the Nina Food Chopper Express. With a push of a button the one-touch pulse control purees fruit, minces garlic, chops vegetables, and much more. The ‘more’ part means it can be used for nearly any kind of food preparation. The processor is ergonomically designed, making handling easy. The ergonomic design includes a nonslip base and a splash guard that doubles as a storage lid. The splash guard helps prevent messes. A salad dressing can be made and leftovers put in the lid for storage in the refrigerator. The bowl has a 16-ounce capacity. Having few parts make make cleanup and storage easy. The parts are dishwasher safe. Sometimes, rinsing is all that is required for cleanup. All parts are BPA-free.The processor takes up little space. One-touch pulsing is an easy to use power pad that produces results in seconds. The one-touch pulsating give precise control that aids in eliminating over chopping food into mush. The Ninja Express is ideal for pureeing, mincing, and chopping ingredients into dips, toppings, dressings, sauces, soups, and more. It is ideal for spreads, chocolate, nut chopping, bacon crumble, cheese, and zest. The manufacturer offers a one-year limited warranty. The Ninja 4 Blade Technology works wonders. The Ninja blades puree ingredients for dressings and salads, herb like garlic quickly, and chops vegetables evenly. Pieces are nice rectangular shapes, not mushy. There are few parts, and the processor is easy to use. There are no headaches caused by lost pieces. The processor is not expensive. Storage and cleanup are easy. The chopper arrives ready to use. Remove the plastic; rinse everything, and plug it in. The Breville Sous Chef food processor is perfect for chopping, dicing, and slicing and comes in three color design choices. The processor also features 5 discs for multi-functioning and three blades. 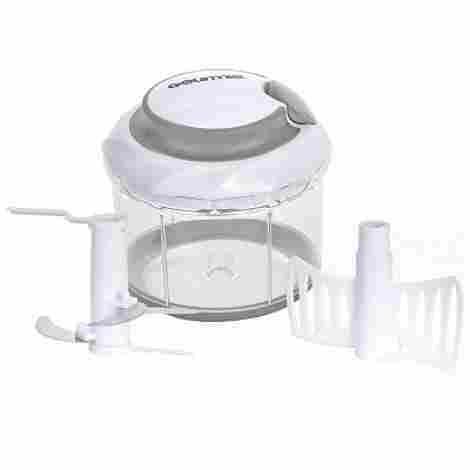 Included with this handy food processor is an accessory storage box and an LCD display timer. Safety is important in the kitchen, and that includes safety when using your food processor. 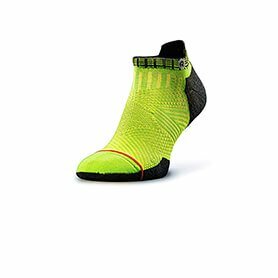 This processor features non-skid rubber feet so that the processor doesn't slide when in use and cause an accident. 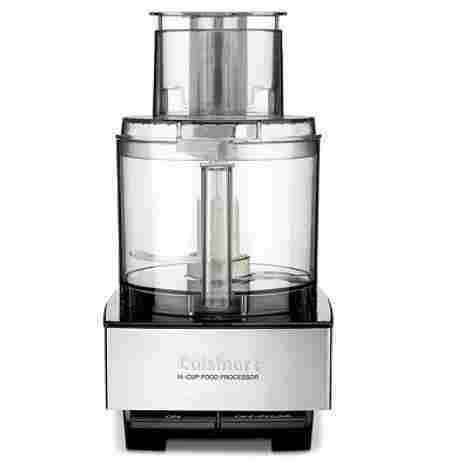 The design of this food processor is sleek and elegant, meaning it will look and work well on any kitchen countertop. You have your choice of three different colors, so you can match the decor of your kitchen if you want too. While more than a little pricey by normal standards, this food processor promises to deliver. It's sleek design and five discs multifunctions make it worth spending the money to have this one in your kitchen. This Braun 12-cup food processor is a welcome addition to any family who loves to cook. It features an ultra quiet powerful motor, seven blades that are completely detachable and comes with a citrus juicer and a chopper to make the process of juicing an cooking easier. No one likes a food processor that is so loud you have to talk over it when you and your family are cooking together in the kitchen. This food processor comes with an ultra quiet motor, but don't let the silence fool you, it is a strong motor and can get the job done. This processor includes seven attachment blades so that you have a blade that works, no matter if you are chopping, dicing, slicing or any other function it can perform in the kitchen with a food processor. While a little pricey, this food processor does the job. From the ultra quiet, but powerful motor, to the detachable blades, you can't go wrong with this one to help in the kitchen. The Gourmia is a pull string swift chopper that is a manual food processor that features two attachment blades. 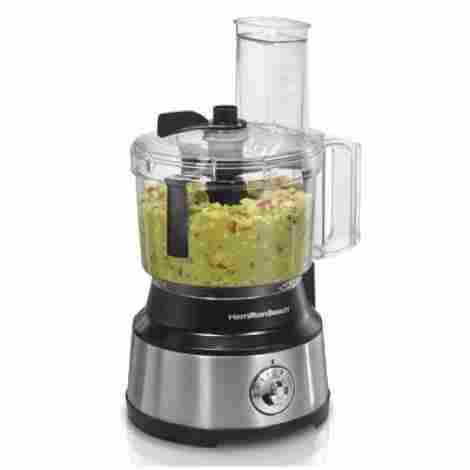 The food processor is made of BPA food safe material and is very durable. It features a pull string operation, quality construction and may be small but it is powerful. The pull string operation allows you to control the blades as they chop the food you desire to the right consistency. It is possible to dice foods or even puree foods to the consistency you want. 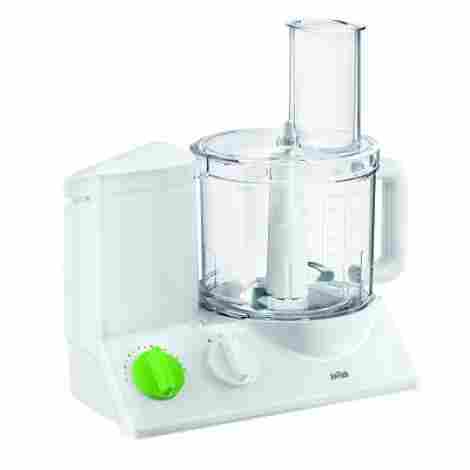 This manual food processor may be small but it is sturdy and powerfully built. It can handle large jobs, even though it is of a small size, chopping everything from boneless meat to tomatoes and onions to peppers with ease. This small, but powerful manual food processor is worth the amount being asked for it. It is convenient, compact and easy to use. Although the Ninja 4-in-1 blender holds 72 ounces, it is compact. It fits under most cabinets when in use. A cleaning brush is included along with an instruction manual and a recipe book. There are recipes for smoothies, salads, slaws, cocktails, and soups. The Ninja 4-in-1 has a 72-ounce pitcher. The markings on the pitcher are in ounces and liters. There is a large blade. A release button on the top causes the handle to rise. Pressing the button lets, you remove the lid. The pitcher has a spout for easing pouring. There is a 24-ounce cup that is great for smoothies. Markings on the container are in ounces and millimeters. It has a max liquid line. Do not fill above the line. The compact cup has its blade of its own and a lid. The spiralizer has a collecting bowl, lid, and pusher. When using the spiralizer, the ingredients should not be taller than four inches. Hard vegetables such as butternut squash and potatoes should not be taller than three inches. Nothing should be wider than three inches. Carrots should be larger than 1½ inches in diameter. There are three blades with the spiralizer. One is a spaghetti blade, another a ribbon blade, and a third a fettucini blade. They are marked. The food processor bowl has an opening that allows liquid to be poured in while processing. The processor has a blade of its own and a dough blade. The base has suction feet. Tabs on the side are pushed up to release the base. There is cord storage on the back. The unit is turned on with a start/stop button. When individual devices are attached to the base, the compatible programs illuminate. Less expensive processors are likely to offer mediocre results. A quick assembly guide is included. The functions of the Ninja 4-and-1 include mixing; chopping; making a dough, frozen drinks, smoothies; and extracting. This Cuisinart 14-cup food processor is available in six different vibrant colors so that you can match it to the decor of your kitchen. It also features a 14-cup durable Lexon work bowl, and a feed tube that is extra-large. Everything but the base of the food processor can be put in the dishwasher as well, for super easy cleanup. This food processor comes with a 14-cup work bowl that is perfect for those large jobs. This is the one you want if you are constantly feeding a large family or if you are preparing food to entertain a crowd. The big bowl makes this food processor the workhorse of your kitchen. An extra-large feed tube is another great feature of this simply designed food processor. It is great because with it being this large, there is no pre-cutting required. It is the perfect size for whole fruits and veggies! If you want high-quality and extra features, then you are going to have to pay a bit more. 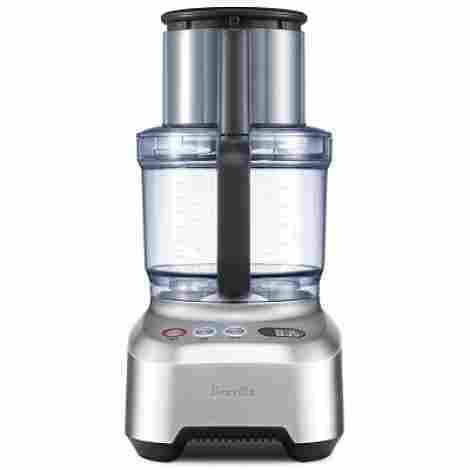 While this food processor is a little bit higher than some of the others on the list, with the extra-large feed tube and large-sized bowl, this one is well worth the higher price. Shred, slice, and chop in style with the Hamilton Beach food processor. This processor features two speeds and pulse so that you can keep total control and reversible disc attachments. The processor comes with different blades, so you never have to manually chop, dice or slice again. The scraper attachment included keeps the sides of the bowl clean as a whistle with no build-up of food that causes frustration to the cook! 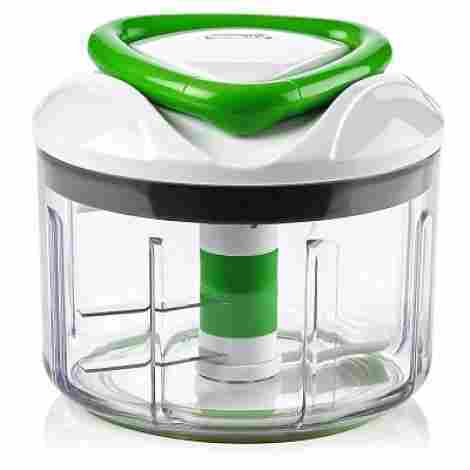 A food processor, vegetable chopper and bowl scraper, this food processor is an electric 10-cup machine! This food processor has a scraper attachment that saves you time when you're pureeing or chopping because you don't have to stop remove the lid and scrape the sides of the processor. Instead, the scraper attachment does it for you, and you can keep on cooking. The scraper also works even when the processor is off. The food processor has two speeds and a pulse so that you have complete control over the chopping process. You can use low speed or high speed or even the pulse and everything is driven by a powerful 450 watt motor for fast processing! With five blades and mixing discs, this food processor can certainly get the job done in the kitchen. Adding in the scraper to save you time, makes this well worth the money you spend to make your time in the kitchen a breeze. This KitchenAid is a 3.5 cup mini food processor that comes in 18 different color choices. It enables you to master awesome dressings and even sauces with the handy drizzle basin. Featuring two speeds and pulse operation, the processor is lightweight, compact, and is the perfect size for any kitchen that wants to use a food processor on a daily basis, without having to drag out the heavier, clunkier version. This mini food processor features a 3.5 cup work bowl with a blade that locks and a pour spout for no-mess pouring. It also features a handle for easy carrying and pouring as well. Compact and lightweight, this food processor is simple enough to use for everyday cutting, chopping, and dicing. You will find yourself inventing reasons to use this handy processor. For the price, this mini processor is a great value. It's compact, lightweight, and can be used every day of the week to chop, slice, and dice your way to a meal with the family! 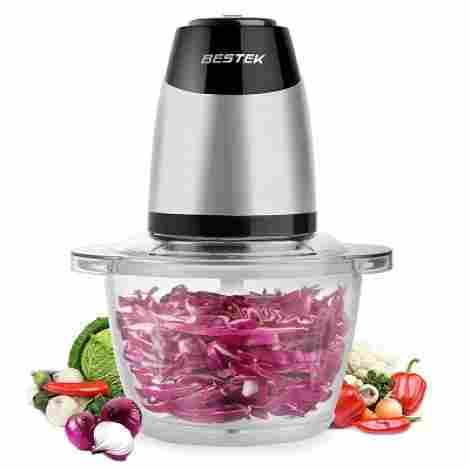 The Bestek is an electric food chopper and mini food processor that is perfect for small kitchens or someone who doesn't need to chop, dice, slice or puree a huge amount at once. It comes with a 5-cup glass bowl that makes it perfectly find for two to four people. This food processor features a quiet electric chopper that is powerful but makes very little noise. It's the perfect size for anyone who has a small kitchen but still wants a food processor to make their cooking a little easier. The food processor features low and high-speed options so that you can grind spices and then chop puree or mix, whichever is the best for the meal you are cooking at the moment. This mini food processor is one of the better ones for the price on the list. The fact that it's mini, but can still be powerful, is enough to make it worth the purchase price. What it comes down to, in reality, is how you are going to use the processor you are considering purchasing. That is why this buying guide is going to feature the top 10 best food processors and review and rate them for quality, so you don’t have too. In this guide, there will be the top 10 best, and then a list with the criteria and metrics used to come to that final decision. There may even be a few tips to help you along the way, on your quest for the perfect food processor to add to your blossoming kitchen collection. Now, without further waiting, read on below to find out what the number one processor is! Since everyone already knows that food processors are a must-have in a well-run kitchen and you are already on the hunt for your first one or even a replacement, the criteria, and metrics used to determine this top 10 list will help you quite a bit. When you are searching for the perfect food processor, mini or large, there are a few things that you should consider before you make that final decision and click that buy now button. The criteria used to choose the best food processors included size, feed chute size, the bells and whistles, power and appeal and design to name a few. With that in mind, keep on reading to find out what criteria you should be using when choosing your next food processor. The size of the food processors offered is important for one reason, the lifestyle that you live. The top-rated food processors come in different sizes to meet your needs. For example, if you live in a tiny house or if you don’t have much kitchen space, then you probably don’t want a huge processor taking up much-needed counter space. That’s when you need to check out mini processors. If you have a huge family or do a ton of entertaining, then you need a large food processor with a big bowl that can help you cook for a crowd. Some models have extra-large feed chutes so that you have to do very little, or no pre-cutting. Most of them can handle whole veggies and fruits. Another good thing about extra-large feed chutes is you will get a much better cut putting the whole fruit or veggie in the feed chute than you will with pre-cutting. The choice, of course, is up to you but many of the top-rated food processors have these. Of course, as with any other product on the market today, there are going to be plenty of bells and whistles to go around. Many of the best food processors offer the bells and whistles, though these will have a much higher price. For example, some of the top-rated offer a bowl scraper, which will stop you from having to take the lid off the food processor and scrape the sides, which, of course, costs you valuable time. Instead, the scraper does it for you. The bells and whistles on food processors are something that you will want to consider in your search for the one that works well in your kitchen. Different food processors have different levels of power. You want one with enough power to do the tough jobs, such as shredding carrots, kneading dough and other tough jobs. If you don’t have enough power in the processor you choose, you will end up without uniform cuts and may even end up wishing you have bought a higher powered processor. Many of the top-rated processors have enough power to handle everything you throw at them in the food, slicing, dicing, and chopping department. While the power the processor has, the chute size, and the size of the food processor itself are important to consider, there has to be something said for design and appeal as well. You want a food processor that will blend into your kitchen, not stand out like a sore thumb. In other words, you don’t want a food processor that is pink in your otherwise all yellow kitchen. The top-rated processors come in many different colors, so you have plenty from which to choose. There are so many different brands, makes, and models on the market today, that it’s hard to choose the right one for you. Reviews, ratings, and the accessories and features you want should be considered. In other words, don’t go out and buy a particular brand food processor, just because it’s a brand you know, love, and trust. Do your research, read this buying guides, read reviews and make an informed design of the brand of food processor you buy instead. Price is always a consideration, no matter what you are purchasing and a food processor is no different. Most of the top-rated food processors can run you anywhere from an inexpensive manual processor that is around $10 to the expensive food processor with all the bells and whistles. The expensive processors can run you into the hundreds of dollars. Determine what you are willing to pay for your processor before making a final decision. There are budget-friendly options and bell and whistle options as well. The choice is yours! You want to look for a food processor that stresses a quiet operation. If you are considering a full-size food processor, then the top-rated ones should be quiet. You shouldn’t have to talk over the processor when it is in use. Mini processors are a little louder, but they still should not be so loud you can’t hear yourself think. The best-rated food processors feature bowls and blades that have solid construction behind them. You want to look at the materials they are made of, with glass for the bowls and steel for the blades being your best bet when it comes to the food processor lasting you for some years. There are manual and electric food processors that made it onto this best top 10 lists. Manual processors tend to be cheaper, and you have to do all the work. Electric processors do most of the work for you and are easy to use, however, they are a lot more expensive in many cases and usually come with all the common features, plus bells and whistles. Do your research and decide which is the best for you, manual or electric, based on what you find. Another metric used in determining the best food processors for this buying guide was how easy the processors are to assemble. There are many things to consider, from the lid snapping securely in place to realizing that the push has to be in the feed tube in some models, for it to work. Whichever model you choose, should be easy to assemble and easy to disassemble for easy cleaning as well. Most food processors have three modes to control them. Those controls are on, off and pulse. That is enough for many people in the kitchen, but if you are a diehard chef or spend a ton of time in the kitchen as a home cook, there are other options out there for you. Some of the top-rated food processors have different mixing speeds to handle different tasks. If you aren’t sure what controls and functions you need to be happy with your food processor, it’s best to research what each one does and see if it’s something you would use. These are the criteria that were used to find the best food processors and then review and rate them for quality. These are also a few of the top things that will help you judge which food processor will make your life easier. Many people love to cook and to spend time together as a family in the kitchen, but in today’s hustle and hurry world, they have a hard time making time for it. A reliable food processor can help with that as it will be the workhorse for your kitchen! Below find some FAQ’s to answer any of your remaining questions! Q: Are food processors dishwasher safe? A: Certain parts of most food processors, any of the removable parts that is, are dishwasher safe, usually only on the top rack though. It is also according to which brand of food processor you have, so make sure to look at the information that came with your particular processor as well. Q: Which is better? A manual or an electric food processor? A: The difference between a manual food processor and an electric one is that one is electric and one isn’t. One is not better than the other, in any way. The only true difference between them is that the electric one does most of the work for you and with a manual one, you do the work. Q: What is a food processor? A: A food processor is a device that makes many of the jobs you do in the kitchen easier, by chopping, dicing, pureeing and slicing for you. The primary use for a food processor is to chop veggies and often fruits. Though today, most standard processors come with a shredding and slicing function of some sort as well. Q: What is the pulse function on a food processor? A: The pulse button on a food processor is used when you need little quick bursts of the processor’s power, but you need it at the optimum speed for that processor. In this case, you are in control of how long the food is processed for. It is handy in making sure you don’t overprocess your ingredients. Q: Can you use a food processor to chop onions? A: Yes, using a food processor to chop your onions, instead of doing it by hand will save you time and energy. On top of that, hand chopping onions make most people cry, using the food processor, not so much. In most cases, pulsing 4 to 7 times will suffice when trying to chop an onion to the desired size. Q: How do you clean a food processor? A: Cleaning a food processor isn’t that hard. You take the processor apart, carefully, so as not to cut yourself on the extremely sharp blades. Once the machine has been taken apart, rinse the removable parts and then put them in the top rack of the dishwasher to run. The parts of the food processor that are not dishwasher safe can be wiped down with a damp rag and then dried. Once the food processor parts are finished in the dishwasher, dry them or let them dry, then put the food processor back together and store. Q: Is a food processor worth the money spent? A: While many cooks love doing everything the old-fashioned way, by hand, there is something to be said for having help in the kitchen. Food processors not only help with chopping, dicing, and slicing, they help with pureeing and even kneading the dough as well. Whether a food processor is worth the money spent is entirely up to the person who is buying it, however. Deciding whether to purchase a food processor for your kitchen is a big decision. Though there are many different options out there, from budget-friendly to super-expensive with bells and whistles to spare, it’s still not a choice you want to take lightly. In other words, you don’t want to hop in the car, run to the local department store and pick up the first food processor you lay your hands on. You want to take your time, do your research, read through the buying guide and decide what the best option for you is. You need to determine the type of food processor will best meet your needs and the size of the processor as well. Once you have a model in mind, it’s time to consider all that you have read in this buying guide from the top-rated food processors to the criteria used to determine which was the best. Once you have determined the best food processor and had it delivered to your home, it’s time to get to know it and start chopping, slicing, and dicing, then cooking the foods you and your family love to eat! Happy cooking everyone!